Looking for bulk chocolate truffles? 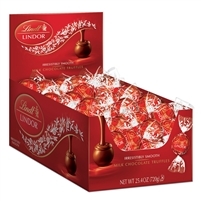 One of the best combinations of affordability and quality arrives from the well-respected chocolate company Lindor. 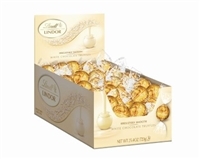 Our line of bulk Lindt chocolate features boxes of 60 that contain individually-wrapped truffles in seven of Lindor’s most popular and delectable flavors: chocolate orange, chocolate hazlenut, white chocolate, milk chocolate, dark chocolate, and more. Sell these luscious treats by the bag or the individual truffle; when you buy Lindt truffles in bulk, the possibilities are endless. 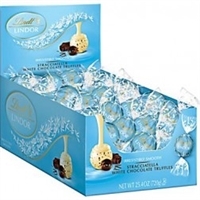 Your customers will go crazy for the Lindt truffles’ smooth, creamy insides and the rich, high-quality chocolate outsides, so don’t be surprised if you sell out quickly. 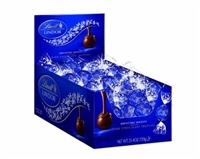 Shop our bulk Lindt truffles today and receive nothing but the best in bargain pricing, and free shipping on orders of $150 or more! Exquisitely creamy chocolate and artistic mastery combine to create our Lindor Truffle with an irresistibly smooth center guaranteed to melt the heart of every chocolate lover.